A brand new staff management with IATA Training! You have recently updated your application and here are the main features of this version. For several months, we have been working closely with the International Air Transport Association (IATA) to offer you a more realistic staff management system! 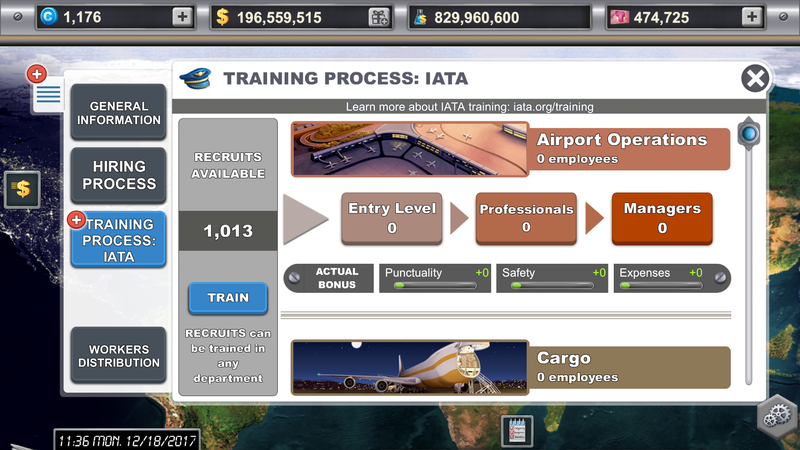 We have completely changed the entire staff management section that you knew by adding a system of workers distribution into different professional departments such as “Airport Operations”, “Ground services”, “Cargo”, etc. Now, you can manage every employee: choosing agency workers, or hiring new recruits under permanent employment contracts and assigning them to each department of your airline. But above all, you can train your employees in each area of expertise so they become more efficient in no less than 45 different trainings! One more good news: no more strikes! Thanks to the IATA Training program, you can make your employees climb the ladder in each department starting from “Entry Level” up to “Manager”. 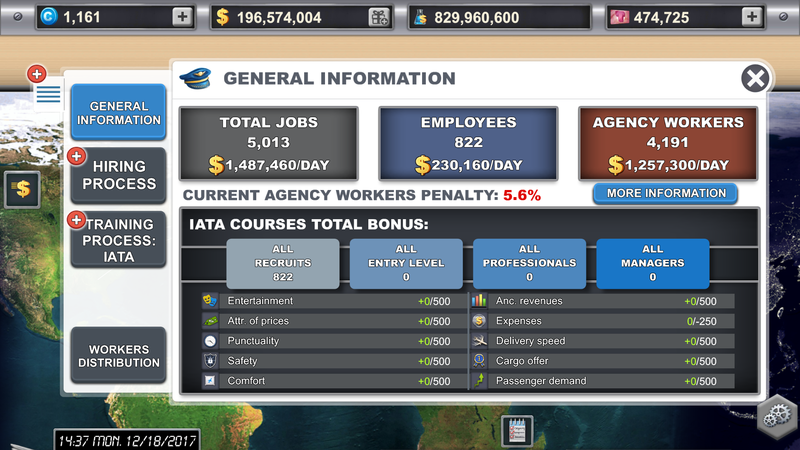 The more efficient an employee, the more profits he/she will grant to your airline and the higher its salary will increase, just as real life! The advantage is that you choose where they should be assigned in the hierarchy. With this new feature, a complete game rebalance was necessary. Indeed, the researches of the old staff management system was entirely reviewed, and you will discover a new dedicated section in the R&D. Around 20 new researches are available! Cherry on the cake, a great part of the R$ you invested in the previous researches will be refunded! But that’s not all, as you already have flight crew members and cabin crew members who granted characteristic points to your airline, we also thought about giving you the equivalent amount of these points with the new system. Therefore, you will have already trained employees who will grant characteristic points that equal to those you used to have. Example: if you had a cabin crew member who granted +5 in entertainment, you will have employees already trained to grant +5 in entertainment. Finally, if your airline had a satisfaction rate higher than 100%, you will have the pleasure to receive a few million dollars in the coming days! It will amount to 4 million dollars per satisfaction percentage, that is a total of 400 million if you had 200%, the highest satisfaction rate. To discover and master the whole feature, we recommend you to read the articles of the dedicated section here. The browsing system has been reviewed so it can be smoother and simpler. When you close a page, you go back to the previous page without browsing again through all the same pages. It can be very useful in case you haven’t finished your changes. To close all pages after finishing your changes, you just have to press ad hold on the closing X button of the window. 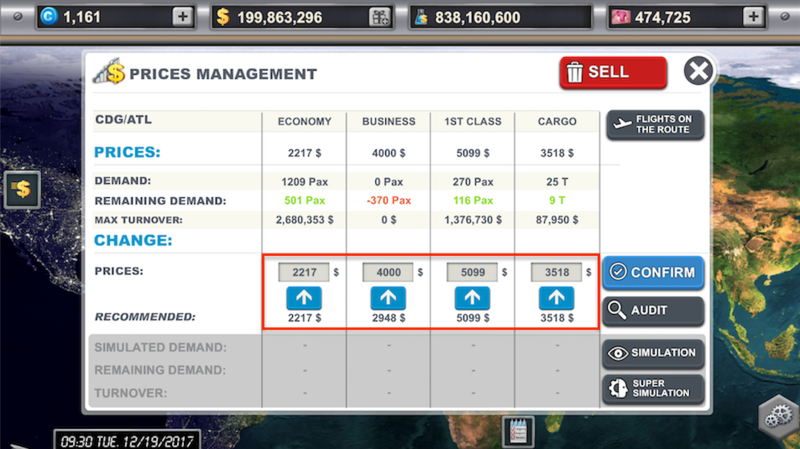 Loading times have been optimized to facilitate your hub purchases and route creations. You can now browse faster through the whole game! Changing a route’s ticket prices is now simpler.